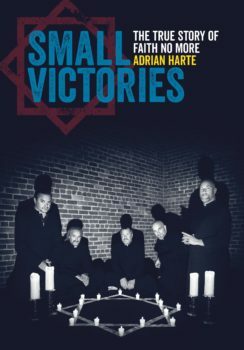 Former BBC man Adrian Harte is aiming to reach the top of the charts with a new book on rock group Faith No More. Harte, who was on BBC Sport for two years and also a casual sub at The Guardian in the early 2000s and now works in UEFA’s media and comms department in Switzerland, sees his passion project published next month – a landmark in 30 years of following the US band . Irishman Harte, who began his career on the The Northern Standard in Monaghan, has been a big fan of the group since his teens and set up the go-to website for FNM fans nine years ago. He is pictured above with founder member Bill Gould. But it was more than fandom made Harte want to write the biography. Harte pitched his proposal to publishers in the US and UK in 2017, opting for London-based music book specialists Jawbone Press. He then spent time with the band in their native San Francisco, and conducted over 100 interviews with 40 key figures for the book, writing his 100,000-page tome in evenings and weekends and one two-week stretch in a secluded farmhouse. The resulting book tells the story of how Faith No More helped redefine rock, metal, and alternative music. The book chronicles the creative and personal tensions that defined and fuelled the band, forensically examines the band’s beginnings in San Francisco’s post-punk wasteland, and charts the factors behind the group’s ascent to MTV-era stardom. Small Victories will be published by Jawbone Press in early September. It is already available for pre-order on Amazon, WH Smith and Waterstones.